If I had one Nepalese Rupee for every time I said “WTF” in Nepal, I’d have enough rupees to purchase a Tibetan singing bowl (that’s like, 750NPR). If I’m honest, my mixed emotions make me wonder if I even liked the place. For starters, let’s talk about the pollution. As I licked my teeth at 10am on our first day in Kathmandu, I felt dirt rub against my tastebuds. Strange, I’d brushed my teeth only two hours earlier, and we hadn’t even left Bibek’s house – we were merely standing on his roof top in Basundhara, people-watching. Cameron isn’t happy because he forgot his binoculars. Nepal has awarded itself 10th place on this list of ‘Countries with the most polluted urban areas’. Before landing, I’d heard all about Kathmandu’s dusty air causing respiratory problems for many travellers and I had no doubts that I’d be left with a whispy voice, but I never thought it’d bother me that much. As we drove from sunny Tansen to Lumbini on the plains of Nepal, the car inserted itself into a huge cloud. Turns out it wasn’t a cloud. It was thick pollution. The night we arrived, Bibek showed us to our room. It was a homely space with green painted walls, a pink en-suite (kitted out with tooth paste and tooth brushes for the three of us), one single bed, one large bed, and barred windows – to keep the crims out, I guess? Kusma is home to Asia’s longest suspension bridge. I couldn’t help but wonder what this place would look like on a clear day. They say the pollution is worse during winter. Add the fact that Kathmandu hadn’t received rain in a whole month when we arrived, and pollution becomes a huge issue. Then, there’s the issue of trash littering the streets. To say Nepal is in dire need of better education around waste management would be a total understatement. What can we do to help? Probably avoid purchasing plastic as much as possible, and finding a bin to place our rubbish. Keep the windows of your hostel/homestay/hotel/guesthouse closed at all times. If you’re at a restaurant, cover your glass of water with a napkin. Ask your driver to keep the window closed as you drive around. Masks are actually not worth a dollar. They say they’re useless after you’ve worn them for three minutes. Good lord Shiva, the people of Nepal are so kind and generous. I’m convinced they’re the kindest in the whole world. But, I haven’t been to many places, so I’ll have to travel a little more to be sure. I woke up early in Lumle, and stepped outside to watch the sunrise. The lady who owned the hotel was sweeping near me as I attempted some yoga. When we arrived at Tribhuvan Airport, we met Bibek outside and were followed to his car by his “friends”. They politely took my bag and carried it 20m to the car, placed it in the boot, and asked for a tip. I know what you’re thinking, that’s scam number one in any country – never let someone carry your bags for you. But, I was so convinced they were actually Bibek’s friends, this scenario hadn’t even crossed my mind. Luckily, I didn’t have any NPR on me, so I firmly said “No, I have no money.” And they buggered off. However, Cameron handed over 3,000NPR (that’s approximately $30) – we’d just arrived, and he had no clue how much those three notes were worth. These two young girls were watching us with some serious curiosity when we stopped off in a tiny town on the way back from Chitwan to Kathmandu – for the bathroom, of course. Following that incident, I was armed ready for scammers on the streets, outside Boudhanath Stupa, at Swayambhunath (monkey temple), and inside the shops of Thamel. Safe to say, not once were we scammed again (to my knowledge – maybe they were the most cunning of scammers). My experiences in Vietnam and Thailand were riddled with scammers and con artists trying to make a few extra bucks. Contrary to what I expected, however, the people of Nepal were not out to get us – and they probably won’t be out to get you, either! Cam and Rupa have a jam sesh. Cam plays the acoustic guitar, Rupa plays the sarod. Bibek drove headlights first into a crowd of people without breaking a sweat. He navigated his way through the un-named roads of Pokhara and Kathmandu like a champion, and didn’t even flinch when the car dropped into a pot hole. At first we wondered how he managed to get from A to B without using maps, but then we learnt that detours and road-closures were an all-too-common thing in Nepal, and updating maps would be a difficult job that nobody would sign up for. I’ve never been one for motion sickness, but the roads in Nepal gave me another type of tummy ache. Anxiety pains. On the way from Kathmandu to Pokhara, we pulled off the road to a small village where Bibek met his business partner. He told us, “Yesterday I got into an accident with a bus, and walked away with two holes in my pants and a scratch on the mirror of my motorbike.” He spoke about the incident with an incredible sense of calm, and shrugged it off with a smile. 204 kilometres would take approximately two hours to drive in Australia, but it took us six. To think we didn’t see one accident blows my mind, but don’t be fooled, these roads are riddled with issues. Apparently, if a truck gets stuck on a mountainside highway, people will come to dismantle the entire vehicle. That’s right, instead of getting a larger vehicle to drag it out, they choose to literally take the truck apart, piece by piece, until they can lift the chassis and wheels to rest on the slope of the mountain. 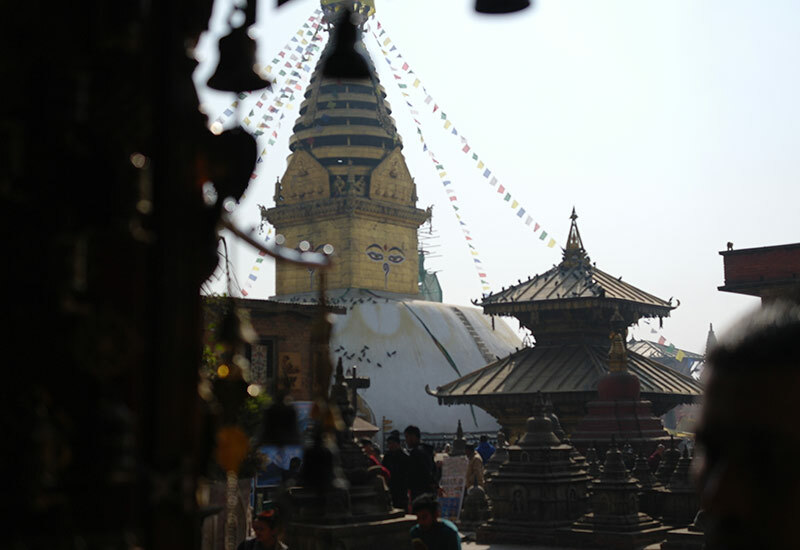 On day one we tried our first plate of momos at a restaurant overlooking Boudhanath Stupa. Momos are a Nepali dumpling. The tastiest one I tried was filled with buffalo meat (despite going vegetarian while in Nepal, gee am I glad I took a bite of that dumpling). Along the trail to ABC we feasted upon potato and cheese momos or vegetarian momos almost every day. When you’re hiking, the momos will vary in excellence. I’d recommend you lower your expectations when it comes to eating inside teahouses. Our first plate of momos was shared at a restaurant overlooking Boudhanath Stupa. What a spiritual moment it was for us all. You’ll find some pretty neat bars in Kathmandu. We stopped in for brewski at Beers N’ Cheers and the guy behind the bar offered Cam a puff of the shisha. The wall art inside Beers N’ Cheers is another reason to visit. The best meals you’ll ever try will be served at a local homestay. Nothing could beat Rupa’s delicious homemade meals: dal bhat and rice, spicy muesli, homemade candy left to dry in the sun, and her delicious home-brewed tea. Sharing the shisha and stories by the fire after dinner at Bibek’s place. My love/hate relationship with Nepali food will forever be a battle I choose to gracefully accept defeat. It was our first night off the trail, and we’d arrived at our hotel in Kusma. Our dinner took almost two hours to prepare, and as soon as the plate of dal bhat was placed in front of me, my nostrils could sense the spice. I was right. The following morning at 2am I was straight up and to the bathroom. No further details required. Early morning in Kusma. This was just moments after the hotel owner’s dog almost got run over by a motorcycle. Toward the end of our trip we went to a second-storey bar in Thamel, Maya Cocktail Bar. I selected a mango daiquiri to go with my empanada, and shortly after we ordered I looked over to see one of the bar tenders sticking his hand (not gloved) into a glass, plucking out cubes of ice. When our drinks were delivered to the table, the ice was blended in the cup. I stared at the cup for a few minutes before making the stupid decision to drink it quickly, before the ice melts. My friend across the table said he’d enjoyed a good 21 or so cocktails there a few weeks back, and swore that it was just a hangover that knocked him about. To this day, I’m not sure if it was the empanada or the daiquiri that gave me gastro, but I’m a firm believer the ice did the trick. If you can’t handle chilli, don’t say “No spice” to your waiter. Say “No chilli, please”. If you say no to spices, they’ll strip your meal of anything remotely tasty. Chilli = chilli. Spice = everything that tastes good. Always say no to ice, and never drink the tap water. The pharmacy is your friend. If you’ve been feeling sick for longer than two days, give the pharmacist a visit. They’ll fix you up real good. Let’s be honest, nobody goes to Nepal for intricate architecture and forward-thinking technology (try, I don’t know, Japan?). 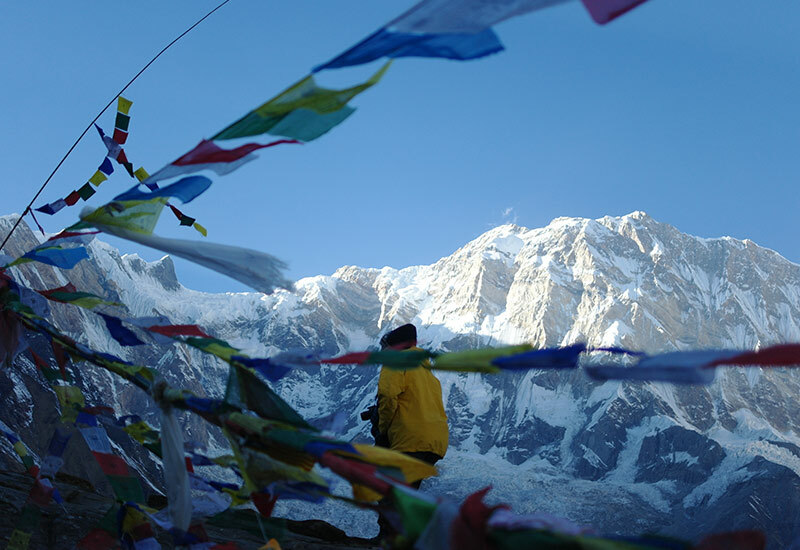 A trip to Nepal should primarily be to see the 8,000m+ mountains from the trail, or to climb them. Imagine, after four days of trekking, standing at the foot of the world’s deadliest mountain. Seriously, you can’t argue with Annapurna I’s 35% fatality-to-summit rate. Literally takes your goddamn breath away. Thanks, altitude. Or, getting up early to catch the first rays of sun hit the top of 6,993m high Machapuchare. 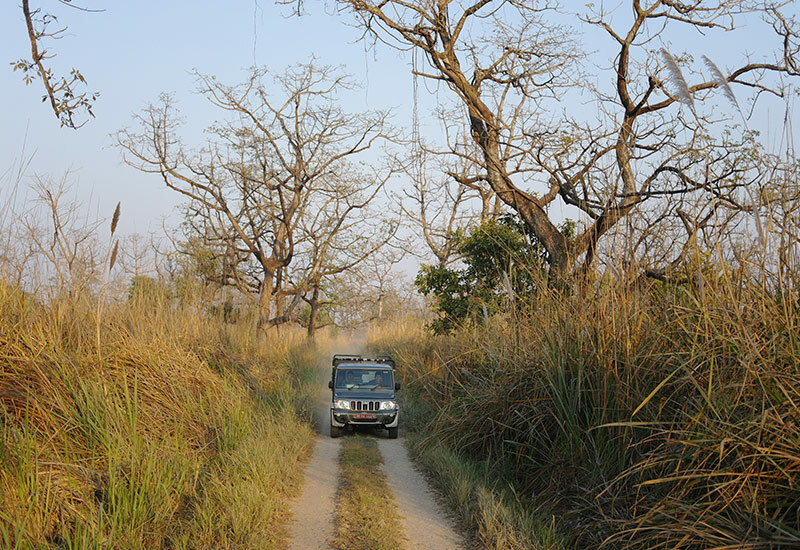 Now, imagine strolling the streets of Chitwan National Park, dodging elephant dung while watching an elephant trainer whack his elephant in the head with a giant stick. Beware: If you’re travelling to Nepal for a trek, and suddenly find you’ve got extra time up your sleeve to see the rest of Nepal, you might be underwhelmed. We’d planned to spend 12 days on the trail to ABC. We did the trek in six. We spent our remaining nine days in Nepal driving the sphincter-rattling roads to see Buddha’s birthplace (Lumbini), catch a sunrise over ‘white lake’ in Tansen, seek rhinos/tigers/sloth bears in Chitwan, and explore Pokhara’s Lakeside. A jeep comes toward our jeep on a one-way track. Monkey temple is surrounded by stores selling trinkets. 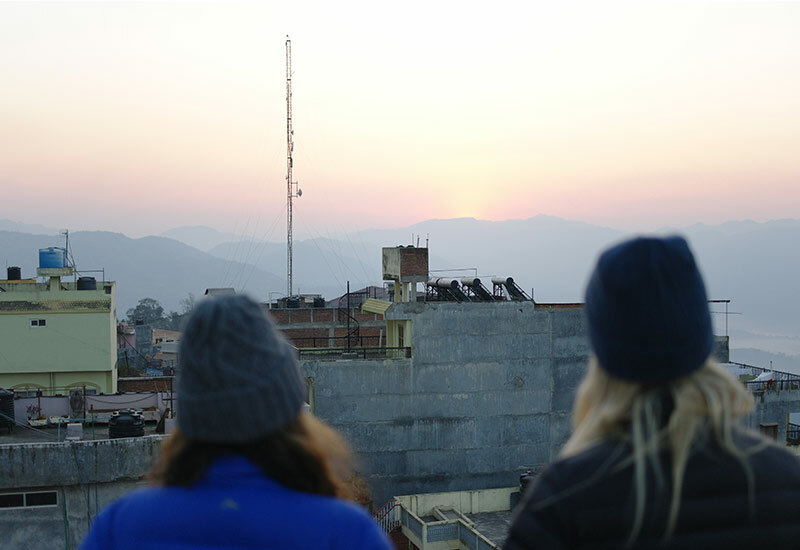 Suvini and I watch the sunrise over Tansen, Pulpa. While those experiences were certainly worthwhile, nothing beats trekking in Nepal. Nothing. “I’ve been to some grim places. None of them were that grim. Not even close.” We were on our way from Kathmandu to Pokhara, and Suvini was desperate for a toilet. Desperate, I tell you. Bibek pulled off the road, and gestured toward a small metal shack with the word, “Toilet” painted on the door. She ran toward the door with toilet paper and hand sanitiser. She emerged a changed woman. You too will likely experience a grim toilet stop. Embrace it. The view from the toilet wasn’t that bad. Now, let’s talk about the showers. It goes without saying, Nepal’s bathrooms would be a much safer place if showers had doors – or a curtain for f#$k sake. I’m not sure if plumbers are lazy over there or if it’s a budgeting issue, but surely a curtain or a shower-screen door wouldn’t cost all that much more to place in a bathroom? Disclaimer: We didn’t pay more than $5 a night (per person) for a hotel room, ever. But some of these places were pretty fancy. I can only hope for those of you who’re staying in really fancy hotels, the showers have actual doors on them. Not just a tap in the middle of a tiled room. Stumbled upon this power box as we walked into Lumbini. I can only assume they attached a lightbulb here so they know if the lightbulb is off, the power is out. About the electricity. Nepal certainly has a long way to go when it comes to wiring and electrics (I’m not trying to be offensive here, it’s a fact), and you will certainly experience a power outage or twelve while you’re exploring Nepal. Note: Nepal’s Wi-Fi is actually better than the connectivity I have back home in Sydney. Our first power outage occurred when we were filling out our visa information on the electronic touch-screen inside Kathmandu airport. We’d literally been in Nepal for a total of five minutes – maybe seven – and the power cut out. Seconds later, it started up again. Airport staff didn’t even raise an eyebrow. And you know what, I love that about the locals. Nothing bothers them – not a cold shower, not a grim toilet, not even the power cutting out while they watch Netflix. We could all learn a lesson (or ten) from the Nepali people. While we’re talking about system failures, this country has somehow created an organised system from absolute and total chaos. In Sydney if there’s a power outage, there’s a goddamn riot in the streets. In Kathmandu, people merely get back to what they’re doing without electricity. In Sydney if the traffic lights stop working, drivers stop functioning until a police officer comes to help direct cars (some 45 minutes later). In Nepal there are no traffic lights – because the electricity is so fickle – so drivers choose when to turn when it suits them. He… He isn’t seriously going to cross that bridge on his motorbike… Is he? The answer is yes, he did. While we were walking on it. By the fourteenth day, I was loving the chaos and sense of calm radiating from everyone around us. Nepal is such a bizarre place to travel, and such a retreat from my clock-work life back home. Whether dogs on the streets are napping or in fact dead, I’ll never know. But, they’re all incredibly cute. Unfortunately, these dogs are filthy and likely infected with some sort of disease you don’t want to find out about. So, touching them isn’t really a good idea. Looking into their sweet eyes knowing damn well I couldn’t pat them was torture. Will I ever know your name? Probably not. But I’ll never forget you, Doggo. Let’s face it. I actually love this country. Ignore the roads and tummy troubles for just one moment, the mountains and people make every moment of stress and inch of trouble totally worth it. So, if you’re Nepali and reading this, the answer is yes. Yes, I will return to your country. Bandipur is well worth the visit, just in case you were wondering. So glad I read your article. I am going to Nepal in June and really didn’t know what to expect. It seriously was! We’re in South America now, and I’m only just coming to terms with how much I actually loved Nepal!